The last time the heritage town saw such flooding was in 2008. 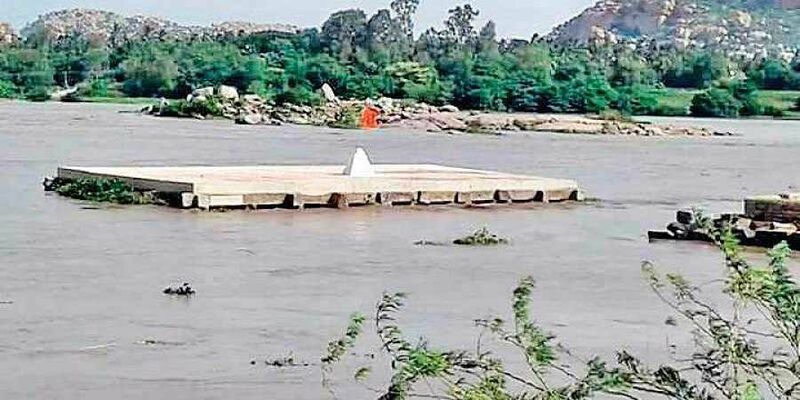 BALLARI: Several monuments at the world heritage site of Hampi were inundated on Thursday following heavy discharge of water from the Tungabhadra dam. The last time that Hampi saw such a flooding was in 2008 and before that in 1992. Apart from the Purandara Mantapa, the old bridge and several other smaller structures are also submerged. Also, Virupapura Gadde, which is across the river, has turned into an island and boats carrying tourists have been restrained from venturing into the river. As on Wednesday evening, the water level in the dam stood at 1,630 ft as against the full capacity of 1,633 ft. While the inflow into the dam was at the rate of 64,874 cusecs, the outflow was 45,000 cusecs (17,000 cusecs into the river and the remaining into the canal). According to Nagaraj S, a businessman in Hampi, the increase in water level has been attracting more tourists to the town. In 2008, when the rivers in the state, hundreds of villages in Vijayapura and Bagalkot districts were flooded. Even, Hampi was badly affected. Residents of Hampi, however, say it was the 1992 floods that still haunt them. “We still remember that the entire car street (now known as Bazaar Street) leading to Virupaksha temple was filled with water in 1992. Kodanda Rama temple (also called as Rama Lakshmana temple) was under water for weeks,” said Nagraj. Veereshayya, a retired government servant from Kamalapura, said, “The police station what you see on Hampi Bazaar Street today was earlier the headquarters of Kannada University. The entire building was submerged and the varsity had lost lots of books and other documents.” “In 1992, water had reached Yantrodhara Hanuman temple and submerged Kodandarama temple. The Bazaar Street had literally become a river for weeks,” he said. Veereshayya added, “Kodandarama temple and Yashodhara Hanuman temple were completely inundated in 1992. In 2008, the water had reached the temple foothills. Priests would wade through the water daily. The water today is nothing compared to that,” he said. Sirsi: Vishwesha Theertha Swamiji of Udupi Pejawar Mutt has condemned the state government’s proposal to draw water from Linganamakki reservoir in Shivamogga to quench the thirst of Bengaluru. He said it will prove harmful to the environment and the next generation will face the adverse effect of such projects. Addressing the ‘Save Western Ghats’ convention here on Thursday, he said before taking up any such projects, the government should discuss it with experts and local people. Diverting/linking rivers will affect people living in the coastal region and also the rich biodiversity of Western Ghats. Therefore, the government should drop the plan of ‘transporting’ Linganamakki reservoir water to Bengaluru, he said. “I have concerns over the problems of people living in plains and scarcity of water there. Diverting rivers have adverse effects,” he said. Ballari: As more water is being released from Tungabhadra dam, people residing in the downstream have been put on high alert. A few monuments in Hampi have been inundated. The increasing water level has inundated the famous Purandara Mantapa, the historical bridge and other monuments. As the storage in Tungabhadra dam has touched its full capacity, the authorities have decided to release more water into the Tungabhadra river. As of Thursday, 45,000 cusecs of water has been released from the dam. Water has been released by opening 20 of 32 crest gates.